Olivier Couppey was born in Cherbourg, France in 1968. He has been interested in nature as he was very young, and more particularly in birds, that he observed and painted. He discovered photography at the time, acquainted himself with black and white photo prints. Travels and 8mm film edition have led him to study in an audiovisual school. He started his career in charge of the video production of a small company outside of Paris and then moved to the capital city to work as a freelance editor. In 1995, he seized the opportunity to work for a company devoted to the protection of Nature in Saudi Arabia. . He was in charge of the production of multimedia tools for education and information and had a lot of different occupations : documentaries and reports production, graphic creations and development of a website. . 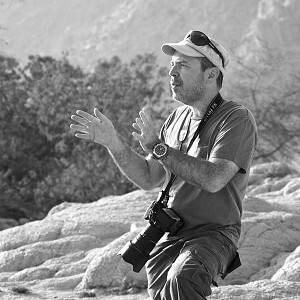 He is still living in Saudi Arabia and still fond of photography, capturing nature and a lot of other different things. .